A new single-source dental carrier offering out-of-network coverage. 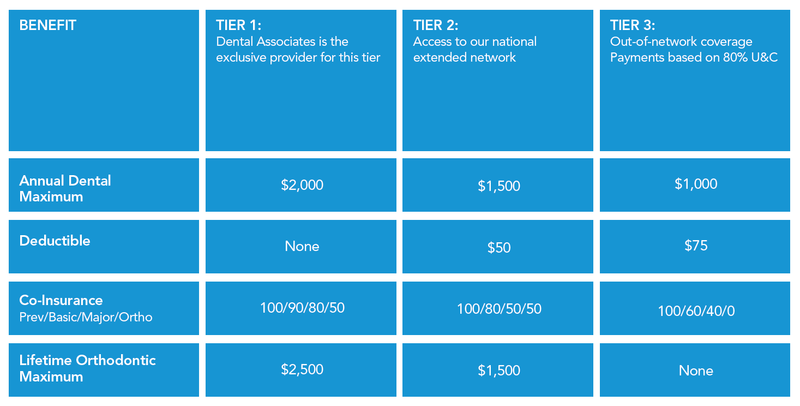 We are now proud to offer a national extended network to provide you with the most comprehensive dental benefit options offered as one plan. This plan is called CarePlus Total Access. It is a unique option that offers maximum choice to its members with minimum administration to help control costs. With CarePlus Total Access, you can now provide your employees with dental care regardless of whether they live in Wisconsin, or throughout the United States. To learn more about CarePlus Total Access, request a quote below and one of our team members will contact you soon. Dental Associates has served Wisconsin communities since 1973, and continues to evolve with patients’ interests and feedback in mind to ensure superior care. Since 2012, Dental Associates has achieved accreditation by the Accreditation Association for Ambulatory Health Care (AAAHC). AAAHC accreditation confirms Dental Associates meets nationally-recognized standards for the delivery of quality health care. Dental Associates constantly surveys patients to monitor patient satisfaction and now shares the results of the surveys on each dentist’s page on their website.